The benefits of wet shaving are well-established: safety razors are more economical, they cause less skin irritation, provide a closer shave, they’re easier to clean, and they’re better for the environment. So why on earth have only men been using them? If women started wet shaving, we could have another half of the population contributing to environmental health and saving at least $250.00 per year on shaving accessories, making us all a little bit richer and happier. Though it may be a long-standing gentlemen’s tradition, many women have caught on to the movement, taking up wet shaving as their new preferred method. In fact, it’s especially the women with sensitive skin that have turned to wet shaving, due to the reduced irritation that comes with the safety razor’s shave. 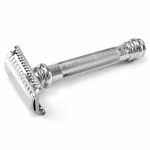 Since the safety razor head only subjects the skin to a single, more exposed blade edge, there’s less pulling, and the hair follicles are sheared more bluntly at a single point of contact. The main allure of the disposables, for both men and women, might well be the convenience they offer: their initial cost is cheaper, they’re available at every pharmacy and corner store, and they require less diligence, allowing you to get the job done quickly. 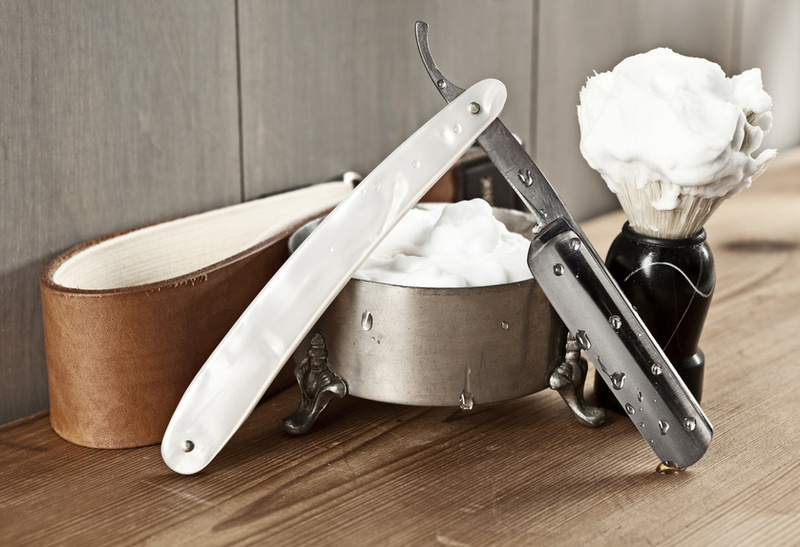 Safety razors, on the other hand, have a steeper initial cost and learning curve, and the process of shaving requires more attentiveness and time. Yet, contrary to popular expectation, the technique-building and time expenditure have been the very attractive forces of wet shaving in the eyes of women. 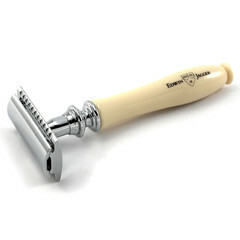 Just as learning a new skill can be gratifying, learning how to use a safety razor properly is a rewarding experience. And, what’s more, women found that the extra time required to shave inadvertently transformed their grooming experience from a means-to-an-end chore, to a soothing spa-like experience. So, we’ve prepared a short introductory guide for women interested in wet shaving, including important tips as well as recommendations for beginners’ products. Since the safety razor head has more blade exposure, there is an increased initial risk of nicking your skin. But as soon as you pick up on the technique, this risk fades, and it feels just like ordinary shaving again. The best technique is to hold the razor at a 30 degree angle to your leg, pulling in short strokes across your skin. Most safety razors are heavier, with handles made of stainless steel, so there’s no need to apply extra pressure while shaving; the weight of the razor itself offers sufficient pressure for a close shave. Do I Need to Replace the Blade? Unlike disposables, safety razors require regular blade replacements. These blades are double-edged, and they often come in packs of 100. They’re inserted inside the razor’s head and held in place by a top and base plate. Though this may sound cumbersome, blades are extremely cheap, costing less than 10 cents per blade, and they’re easily inserted. In general, a single blade lasts 1-3 weeks, depending on the volume of hair and frequency of shaving. 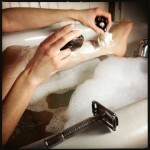 What Kind of Safety Razor is Best? Most lady newcomers have found better success starting out with less aggressive safety razors, since their hair tends to be finer and less voluminous. The aggressive razors are better suited to thick-bearded faces, while the less aggressive razors are better for finer hair on legs. When starting out, it’s best to avoid the slanted head safety razors, since they’re particularly aggressive and require more skill to use. Featured below are 2 safety razors favoured by our female staff here, at Fendrihan. 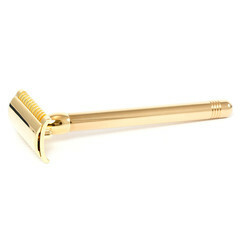 Typically, wet shavers use a shaving brush and shaving cream along with their safety razor. The brush is soaked and used to work up a lather with a few swirls along the surface of the shaving soap. 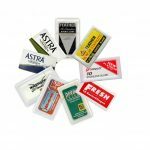 Shaving soap is a popular choice due to reduced skin irritation as compared with commercial shaving foams and gels. And, if you want to indulge in some seriously restorative relaxation time, using the shaving brush to apply lather can be a real treat. So, ladies, give it a shot, and let us know about your experience: it’s never too late to pick up an old tradition and make it your own.